Saffron Tree: How Many Donkeys? How Many Donkeys? is a book of counting from the Middle East, adapted from featuring the "wise fool" character Jouha. Jouha sounds similar to the Indian Birbal, whose tales are filled with wisdom and silliness, and who puts himself into and figures ways out of tricky situations. The author in the preface introduces us to variations of the Jouha character in the Middle Eastern folk literature - Jouha goes by Goha in Egypt, Mulla in Iran, Nasr-din Hodja in Turkey. How Many Donkeys?, a Saudi tale, counts on Jouha's silliness. Jouha is loading his ten donkeys with dates so he can sell them at the market. He is responsible for taking the donkeys to the market and bringing them back safe, so he counts and re-counts make sure he has ten. Whenever he counts, "Wahid, Ithnan, Thalatha...", we count aloud with him. We see the numbers written from right to left, in Arabic and English numeral and spelled in Arabic with English pronounciations, at the bottom of each page. Jouha counts again mid way and he realizes there are only nine! Oh no, I lost a donkey, I must be unlucky, he thinks. His friend urges him to count again, and when he does, there are ten! But again at a rest stop, there are only nine! To be sure, he gets off his donkey, steps back and counts again, and there are ten. This goes on and on upto the market and on the way back, until Jouha arrives at the brilliant conclusion - if he counts when he's on a donkey, one escapes, but if he is standing on his feet and counts, none can run and there are ten. But how? Jouha never solves the Mystery of the Missing Donkey, but your preschooler might have a clue. The illustrations by Carol Liddiment take you to the other side of the world to a place filled with orange sand dunes, bedoin dwellings, palm trees and camels bring this folk tale closer to authenticity. The painting of the desert at night, with the crescent moon when Jouha rests under the trees is especially breathtaking. My Arba'a year old, I mean, my 4yo, enjoyed the illustrations, especially the facial expressions of Jouha ranging from content to dismay to joy; and laughed at his repeated "I'm unlucky/I'm lucky." He was also interested to see numbers written a different way, and we copied a few. Repitition, humor and a little escapade to a culture different from our own made How Many Donkeys? a fun read for all of us. Sounds good. I'm always on the look out for bilingual books (or at least books which have bits of other languages and cultures in them) as we're a bilingual household and so my eldest enjoys seeing other kids who also have two or more languages. Love the seamless flow in your reviews. 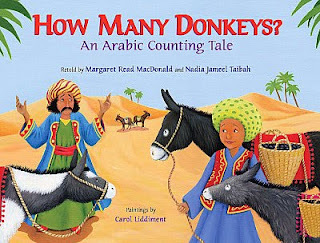 A Middle-eastern counting folktale, a precious find indeed! Thanks, KM! Now where o where do I find it here?! Incidentally, thanks to your review, we've checked out a few more of MRM's books - Fat Cat (a Danish Folktale, a recent hit with both kids - the repetitive factor appealed to the toddler), as well as Slop!